Het restaurant bevindt zich op de eerste verdieping van het Babylon Hotel Den Haag. De hoofdingang kunt u via de Bezuidenhoutseweg vinden. Via de lobby kunt u de trap of de lift naar de eerste etage nemen. 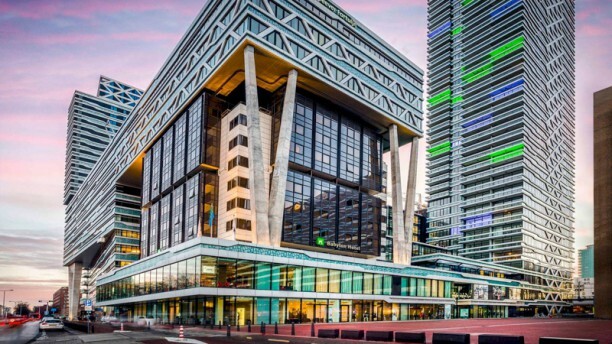 Let op: veel werkzaamheden aan het plein. Super attente bediening en lekker eten. Vooral de vissoep en tete moine salade bevielen ons erg goed. Langere wachttijden tussen de gangen maar niet storend. The food we ate was lovely - cauliflower risotto, smoked duck breast salad and seafood soup followed by whole sea bass with roasted veg, a burger and fries and seafood pasta. Desserts were a chocolate creme brûlée, a cheeseboard and a little tart with mango sorbet. I marked service down a little as I took the 4-course menu and they forgot to bring one of the courses - probably a misunderstanding as the others took a 3-course. Great location by Central Station in The Babylon Hotel. I would like to thank you for your review. I am glad to hear that our food was lovely. I am very sorry to read that you had a 4-course menu and only got three courses. We will definitely make sure that in the future our staff will be more attentive to our guests. We hope to welcome you in our restaurant soon. Alles was Top. Ga weer naar toe???????? We booked this last minute on a week night, and had a really great experience. Very attentive service and welcoming setting. Food was unique and innovative- De sirloin steak was our favourite! Nice place to have meeting. Quite. Plates are bit small. Recommended. The food was good, taste for each product honored, the carrot, the mushroom, the fish; the started was also an interesting taste combination. The atmosphere was calm and restful and the view open on the Malivield park. Good service. This was a very nice evening.